You are here: Home / Saws / Band Saws / What is a Band Saw Used for? The Band saw is a cutting tool that can be available in various sizes and shapes. In simple words, we can say that the home band saw is a cutting machine that cuts almost everything. It can cut wood, it can cut metal, it can cut glass and many other objects. The professionals choose band saw over other cutting tools because it offers better accuracy and it takes less time than hand-operated cutting tools. All the professional wood workers are using band saws for several operations. Let us explain some band saw uses, if you don’t know that why it is used. The band saw is the most trusted cutting tools for resawing because it offers excellent cutting of required wooden objects. The users subject a wooden plaque on the band saw machine to produce another plaque of the same width. The thickness would obviously change, but the overall quality of the wood would be same. The inner portion of the both plaques would look the same. The woodworkers use band saw machines for resawing because they need to produce similar cabinet doors and other furnitures. In the simple words you can say that resawing is a process of producing thinner pieces of subjected wooden plaques. Wood boards, which you receive from the mills, have rough edges. Obviously, you would not use all the boards at the same day and their rough edges can cause trouble during the work. 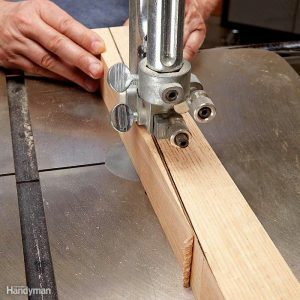 The band saw can be used for smoothing the rough edges of wooden boards. The woodworkers also reset the edges of wooden boards before using them as table tops and counter tops. The customer would be angry, if you don’t provide the table with smooth edges. So, use the band saw to reset the edges of the wooden boards. The woodworkers produce several thin pieces of wood boards to create the veneers. These veneers are used as the upper surface of various furnitures like tables, drawer fronts, chairs, cabinets and other furnitures. The band saw is the best cutting tool for producing veneers because you can pre-set the width and then cut the wooden board to produce veneers. It takes less than a minute to produce the veneer of a small size’s wood board. A number of blades can be used in the band saw to improve the smoothness and cut quality. You can compare the band saw’s capacity of producing laminations with any other cutting tool, you will find that band saw makes the best laminates. Cutting thinner slices of wood board becomes a very handy task, when you use the band saws. You can improve the design of the furniture by using those laminates and improve the quality of the furnitures. There are several other band saw uses, which make it an effective cutting tool for all. In the industries band saws are used for cutting metal sheets, pipes and hard metal objects. Of course, the type of blade change, but the cutting tool remains the same.